Because sometimes long-winded answers are needed. How much teeth whitening gel do I need? How many applications in 1 syringe? Each 3ml syringe delivers 3-4 applications (both top and bottom teeth). Most people need 7-14 applications (once per day, 1-3 hours per application) to completely remove all stains from their teeth. This varies from person to person depending on the type and severity of stains on the teeth, as well as the length of time per application. Keeping a white smile requires annual maintenance. Since whitening gel is less expensive when purchasing trays, we recommend that our customers purchase more gel in their original kit. Also, since shipping costs are the same, international customer are also highly recommended to purchase the 6 or 9 syringe package on their initial order. Our teeth whitening gel and desensitizing gel has a 2 year shelf-life (if refrigerated) so purchasing extra gel will ensure you are able to to keep your teeth stain-free. How long does it take before I get my custom-fitted whitening trays? Once you’ve ordered your tray creation kit, it will be shipped within 24 business hours. Once shipped, you should receive your kit within 3-4 business days (if within the U.S.; International shipping can take up to 14 business days to deliver). You will then need to create your dental impressions, complete your consent card, and send them back to us. We should receive your package within 3-4 business days (within the U.S.; approx. 14 business days international). Our dental lab will then create your custom-fitted whitening trays! The tray creation process takes 3-6 business days to complete. Once your trays have been shipped, they should reach you within 3-4 business days within the U.S. (approx. 14 business days international). Should I be using the desensitizing gel? 60% of Americans suffer from natural tooth sensitivity in everyday life. Whitening your teeth will further that sensitivity temporarily. If you are whitening for extended periods of time (beyond 45 minutes) deep stain removal will likely cause some sort of temporary sensitivity regardless. By blocking pores in the tooth, desensitizing gel dramatically reduces restaining as you eat/drink. How does this product compare to the service offered by my dentist? We offer the exact same, custom-fitted teeth whitening trays as your local cosmetic dentist. In fact, we provide teeth whitening services to many dentists who do not have the lab (or the space) to create trays in-house. Our trays and professional strength teeth whitening gel exceed general dentists standards. By eliminating the dentist and allowing customers to purchase direct, we are able to deliver 3x to 5x faster and at 70% less price. The average US dentist charges $500+ for the exact same service. What is your money back guarantee? Refund Policy? UNITED STATES customers may return their kit within 45 days from the date we ship your teeth whitening tray creation kit. INTERNATIONAL customers may return their kit within 50 days from the date we ship your teeth whitening tray creation kit. We think everyone should have the opportunity to try professional teeth whitening and see just how beautiful their smile can be. In the event that you are not satisfied (for any reason, we offer a complete refund (less shipping fees). To request a refund, use our contact form and await further instructions. You are responsible for the postage to return your trays and any unused gel. Please remember that your custom-fitted trays require a large amount of custom hand work and manual labor. We hope you understand that requests submitted beyond the warranty period will not be honored. How long should I whiten my teeth? We recommend starting with applications of 45 minutes – 1 hour and then working your way up to applications of 3 hours as your teeth are comfortable. If you have sensitive teeth, you will want to stick with shorter sessions and may need to skip a day. It is highly recommended by dentists and hygienists that customers should use desensitizing gel for 20 minutes after each teeth whitening session. Note: Every time you whiten, you are removing years of stains so be patient! If you have to do shorter sessions (but more of them), its ok. Once you have the results you're looking for, it takes very little to maintain those results for life! What is the 2 year tray replacement warranty? How does it work? Our 2 year tray replacement warranty is valid for 2 years (730 days) beginning on the initial order date of your kit. If, at any time, for any reason, you need an additional set of your custom-fitted trays within the 2 year period, the cost is $30 (free US shipping; $10 International shipping). To request a tray replacement, please use our contact form. Can I purchase just the whitening gel or desensitizing gel without the custom-fitted trays? Yes! Our professional-grade whitening and desensitizing gel syringes can be purchased separately in packs of 3, 6, or 9 syringes. Purchasing teeth whitening or desensitizing gel syringes do not include custom-fitted whitening trays. Is professional teeth whitening safe? Will it damage my enamel? Studies from the Academy of General Dentistry, (AGD Impact, April 1998, p.23), during the past five years have proven the lab direct teeth whitening process to be safe and effective. A small percentage of people may experience some tooth sensitivity and gum irritation, which disappears once you stop using the Hi-Intensity Whitening Gel or by decreasing the amount of time you use the whitening system. As with anything, abuse of a product can result in undesirable consequences. In the event that you are unsure of your current oral health, talk with your dentist prior to whitening. Where do I enter a gift code or coupon code? It is rare that we offer discounts since our whitening system is already priced at wholesale rates. However, in the event that you have an active coupon code, you may enter it on the Checkout page. Directly underneath the items in your cart, you will see “Enter Gift Code.” Click this and a box will appear. Will the product whiten or damage dental work? Natural teeth have pores which allow teeth whitening to absorb and remove stains. Artificial dental work such as crowns or veneers are color matched at the time they are installed and do not have pores. The color of your crown or veneer cannot be change (unless it is replaced). Teeth whitening will not whiten or damage artificial dental work including crowns, veneers, bridges, permanent retainers, bonding, or fillings. The teeth whitening process can lighten teeth which have porcelain veneers. Note: Dentists recommend that prior to getting veneers, caps, or crowns, clients whiten their teeth. This way, the restoration work will be installed to match your whitest possible natural teeth. How does domestic (US) shipping work? How much does it cost? Standard shipping is FREE and covers ALL 3 SHIPMENTS! Postage to ship the original tray creation kit to you. Prepaid postage + envelope to ship your impressions back to our lab. All gel shipments are FREE! Who can use the Smile Brilliant teeth whitening systems? Consult your dentist prior to using any teeth whitening products. Not intended for children under the age of 12 or women who are pregnant or nursing. Generally, anyone with healthy gums and teeth that are looking to brighten up their smile can benefit from the our professional teeth whitening system. Our product has been shown to be highly effective at removing stains from teeth, including tobacco, coffee, tea, tetracycline, and various other tooth stains. Our teeth whitening system will not affect existing dental work. Why are custom-fitted trays better than other teeth whitening procedures? All teeth whitening products on the market work by absorbing into the teeth and lifting stains through the open pores. The key to truly professional results is the custom-fitted whitening trays. These trays ensure that every angle of every tooth receives even and consistent coverage of whitening gel on every tooth (regardless of how straight your teeth are). Custom-fitted whitening trays is the most effective whitening procedure offered by cosmetic dentists nationwide. Note: Ultra-violet light is used in professional dental offices to expedite the whitening process. This procedure is different from blue LED lights used in over-the-counter gimmick product. Blue LED lights have no impact on the whitening results you will receive. Be very weary of products offering LED teeth whitening (and not UV light teeth whitening). What is the shelf life of teeth whitening gel and desensitizing gel? Each of our 3ml syringes of teeth whitening gel and desensitizing gel are individually sealed for freshness. Both gel will remain effective for 1 year (if stored at room temperature) and 2 years (if refrigerated). How does this product compare to teeth whitening offered by my dentist? How many applications in one syringe (whitening or desensitizing)? Each 3ml syringe delivers 3-4 applications (both top and bottom teeth). Yes! All our products are cruelty-free and vegan. We do not do any animal testing nor do we work with any factories that do so. The glycerin in our gels is vegetable based. Is the product registered with the FDA? Both our teeth whitening gel and desensitizing gel is registered with the FDA. Our factories are FDA and ISO9001 certified to ensure customers receive the very highest quality in optimal conditions to maintain freshness. Can I use my Invisalign trays to whiten? You will NOT see good results when using invisalign trays to whiten your teeth. Our custom-fitted teeth whitening trays are very different from Invisalign retainers. Invisalign is designed to help shift your teeth during orthodontic procedures. They are made from rigid material and have an incredibly snug fit. Using invisalign trays to whiten will result in all the whitening gel oozing out. This will waste the gel and cause irritation to the tissues in your mouth. Our custom-fitted teeth whitening trays are made with thin and flexible. They are also designed with a reservoir so gel can stay in constant contact with the teeth (instead of oozing out). Is there a deadline for sending in my impressions? No there is not! We’d be glad to create your custom-fitted trays whenever you send in your impressions. Note: In order to take advantage of our 45 day money back guarantee (50 days international), you must send back your dental impressions within this allotted time. How will the custom trays fit/feel? Your teeth whitening trays are custom-fitted to fit your unique teeth! They are made from a thin, flexible material that is virtual unnoticeable. You will be able to speak freely. The trays will stay snug and will not fall out as you open/close your mouth. Note: Dental labs do not create trays that cover the second molars (your very back teeth). These teeth do not need to be whitened. A tray that goes back to the 2nd molars could cause gum irritation and is more susceptible to falling out. That's why we don't do it! Can I make my impressions if I have a permanent retainer? Yes! This is perfectly fine and we have many customers with a permanent retainer or other restorative work. The impression material will not stick to this dental work and the whitening process will not harm the artificial materials or bonding. Just be sure you press your impressions deep enough to cover the retainer in order for your custom-fitted trays to fit perfectly. The best time to whiten your teeth is before bed! It is best to whiten before bed because this eliminates the opportunity for faster staining and allows your teeth to naturally rehydrate and remineralize while you sleep. Brush your teeth without toothpaste: The fluoride in toothpaste will slow the whitening process. Whiten: Whiten your teeth for 45 minutes to 3 hours (depending on sensitivity and dentist recommendation). Brush teeth normally: Brush your teeth with toothpaste as normal. Use the desensitizing gel: Use your freshly cleaned and dried whitening tray to apply desensitizing gel for 15-20 minutes. Remove the trays and discard excess desensitizing gel. Do not rinse! This will leave a thin layer of desensitizing gel on the teeth. Sleep! Do not eat or drink before bed. Sleep and let your teeth rehydrate and remineralize. Mix the putty thoroughly. The blue and white putty should mix into a uniform, light blue color. If the putty looks marble-like, it hasn't been mixed enough. Your teeth are centered on the putty and all teeth enter the putty at the same time. You dont want to push your front teeth in before your back teeth (or vice versa). When making the impression, the teeth sink into the putty all the way up to the gum line. You'll know you have a good impression if you can clearly see the arch where the teeth meet the gums. Leave the impression material in for enough time. You can continuously touch your finger to the excess putty that has oozed out. If it's still soft, leave it in! How long should I whiten? Why everyone is a candidate for using desensitizing gel. Desensitizing gel is fluoride infused to block pores and nourish the tooth thus promoting natural rehydration and remineralization. Gum irritation (turning white or burning sensation). Gum irritation is a rather common reaction to whitening and is not serious. Luckily, there are some ways you can address this. In the event that you have gum irritation, we recommend taking a break from whitening for a few days to allow your gums to recover. You can swish with warm salt water to ease the discomfort. The key to minimizing the gum irritation is to avoid the whitening gel from having prolonged contact with your gums. Make sure you are not putting too much gel into the tray. You only need a thin string of gel along the front, inner surface of the tray to get results. Too much gel will ooz out and sit on the gums. Remove any excess gel that has spread onto your gums with a cotton swab or your finger + a tissue. If irritation persists, rub Vaseline on your gums prior to inserting your trays. The Vaseline will act as a barrier so that less whitening gel is able to come into contact with your gums and irritate them. Important: Always consult your dentist before using any teeth whitening product. If your gums bleed, this may be a sign of underlying dental issues. Cease using the product and consult your dentist. Will this product whiten tetracycline stains? Results will vary from person to person depending on stain level, genetics, and dietary habits. As a general rule, a person with average stained teeth and no natural sensitivity will see results in 7-14 applications. For those with sensitivity (who require shorter whitening sessions), it may take more than 14 applications. Just remember, each time you whiten, you are removing years of staining. Be patient! Once you have removed all your stains, it is incredibly easy to maintain those results for life! Is it safe to whiten my teeth while I’m pregnant? Consult your dentist prior to using any teeth whitening product if your are pregnant, nursing, or may become pregnant. Conclusive research has not yet been done on the safety of teeth whitening while pregnant or nursing. Please note that Smile Brilliant is not responsible for customs fees/import taxes. Do you offer expedited deliveries? Yes! At the time of checkout, you can choose an expedited shipping option. This only covers express shipping of the original kit. If you would also like express shipping of your finished trays back to you, will need to request it by contacting us on live chat or using our contact form. US DOMESTIC: Select USPS Express (1 Day). There is a $30 charge and this covers express shipping of the original kit to you, standard prepaid postage for returning your impressions, and standard shipping of the completed trays to you. INTERNATIONAL: Select USPS Express International (3-5 Days). There is an $87 charge and this covers express shipping of the original kit to you and standard shipping of the finished tray shipment back to you. What is the charge for additional impression material? Did you make a mistake while making your impressions? Each tray creation kit comes with 1 extra set of impression material in case of an error. In the event that you need additional impression material, the cost is $4.95 per set + shipping($3 domestic shipping; $9 international shipping). Please use our contact form to request more material. You can also contact us by phone (855-944-8361; M-F, 9AM-5PM CST), or on our website live chat. Postage to ship your completed trays to you. We guarantee that if you use the product properly, it will remove all the stains that have built up over the years and restore your teeth to their optimal whiteness. It is important to remember that genetics play a big role in the natural color of your teeth. Everyone's natural color is different and no teeth whitening product in the world can modify the genetic makeup that defines your tooth's color. The average person will remove all stains within 7-14 treatments (assuming 2-3 hours per treatment). Other may require more to remove deeply set stains. How does teeth whitening gel work? Your teeth have pores and act like a sponge; absorbing the colors of the food and drink you ingest each day. Over time, those stains continue to get deeper into the tooth and can no longer be removed by brushing or over-the-counter products like whitening strips. To remove these stains, a professional treatment that ensure that every angle of every tooth stays in continuous contact with the teeth that are stained. The whitening gel in a custom-fitted whitening tray gently opens up the pores and soaks into the tooth. Active ingredients lift the stains to the surface. After whitening, your pores require time to naturally rehydrate and remineralize (ie: pores go back to smaller size). This is why it is best to whiten before bed and apply desensitizing gel after each whitening session. Reducing the amount of colored food (especially coffee, tea, wine, and tobacco) for as long as possible will greatly reduce the chances of your teeth restaining quickly. Tooth sensitivity is caused when the inner nerves of a tooth are exposed to changes in temperature (most often cold). 60% of Americans suffer from tooth sensitivity as a result of diet, aggressive brushing, or cracked/broken teeth. In the case of whitening, the active ingredient in whitening gel opens up the pores to lift stains. In the process, the teeth become slightly dehydrated. This dehydration temporarily reduces insulation and allow the nerve to be more susceptible to changes in temperature. Don't Worry, tooth sensitivity due to whitening is temporary! Your teeth naturally rehydrate and remineralize. Sensitivity does not last more than 36 hours generally. We highly recommend using desensitizing gel after each whitening session. It relieves pain and helps protect/nourish the teeth as they rehydrate. Your teeth are constantly under attack by stains in food, drink, and tobacco. These stains build up over time. Each time you whiten, you are removing years of staining. Although results are not permanent, it's very easy to maintain a white smile for life! After your initial treatments to remove old stains, most people only need touchups 4-6 times per year to maintain their ideal results. Is professional teeth whitening safe? Will it damage my enamel? Is this whitening system safe? Will the product whiten tobacco stains? Yes it will! In fact, people who use tobacco products are like to see the most extreme changes. Tobacco stains tend to be more stubborn, but with consistent applications and a little patience, you are guaranteed to see a major change. We recommend our custom-fitted trays + 9 whitening gel + 9 desensitizing gel syringes to remove tobacco stains and reduce future staining. Can I whiten my teeth if I have braces? No. You will need to wait until your braces have been removed to whiten your teeth. This is true for our product and any other whitening product. Because of the brackets on your teeth, you will be unable to make a proper impression. Further, whitening gel can only touch the surfaces of the teeth not covered by your brackets. You would have darker squares on each of your teeth! How does the cariPRO™ electric toothbrush 60 day trial work? 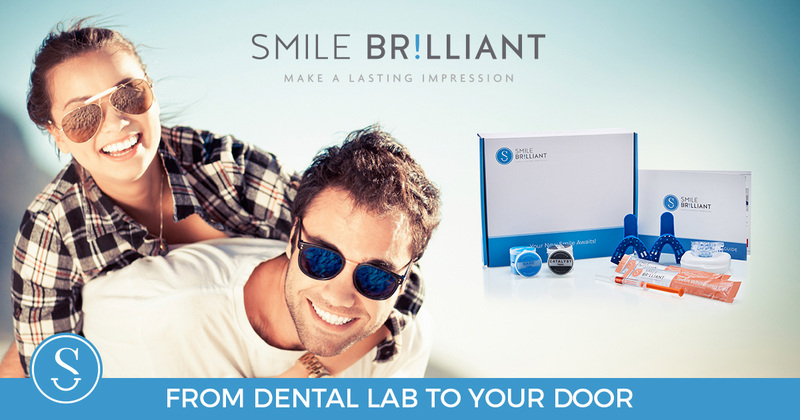 Smile Brilliant offers each of its customers 60 days (from the date of purchase) to try out their new electric toothbrush without any obligation. If at any point during the 60 days, you wish to return the brush, simply request an RMA (return merchandise authorization) through our contact form and wait for approval. Pack up all the contents of the original box and ship them back to the address provided to you in your approval. A full refund will be issued for the original purchase price (less any shipping fees you may have paid). Customers are responsible for paying the shipping fees to return the product. To cancel your trial and return your brush, click HERE. What is the cariPRO™ Ultrasonic 2 year limited warranty? Smile Brilliant warrants the cariPRO™ Ultrasonic electric toothbrush for a period of twenty-four (24) months from date of purchase. Defects due to faulty workmanship or materials will be repaired or replaced at the expense of Smile Brilliant so long as proof of purchase or warranty registration can be substantiated at time of claim*. Use of replacement parts other than authentic cariPRO™ parts will void the warranty. Users should adhere to all instructions included in the user manual and should refrain from actions or uses that are deemed unnecessary or which are warned against in the user manual. Smile Brilliant cannot be held responsible for powering failures due to improper voltage supply to the appliance. Warranty does not cover replacement brush heads. You may make a warranty claim by clicking HERE. Great! Your warranty is automatically registered and store in our system. There is nothing more you need to do! I received the toothbrush through my dentist or insurance company. Lucky you! When you buy (or receive) a cariPRO from your dentist or insurance provider, you must fill out the warranty registration form. If you are unable to do so, you can register your toothbrush over the phone by calling 855-944-8361. Can I use cariPRO™ replacement brush heads on Sonicare toothbrushes? If you have any questions about your toothbrush or the right replacement brush head for you, contact us today and we’re happy to help! NOTE: The brand names mentioned above are registered trademarks of Philips Corp. Smile brilliant is not an authorized distributor, nor otherwise associated with Philips. Smile Brilliant does, however, represent its cariPRO™ replacement brush heads as brush heads that are compatible with and usable on the models mentioned above. Do you ship the electric toothbrushes internationally?